In the world of computers and security, there are some companies that once had a decent reputation but went downhill and now cannot be recommended or trusted. I would now put CCleaner in that category. Here’s the story. CCleaner was actually introduced in 2003 – 15 years ago. But it wasn’t rolled out under that name initially. Its original name was Crap Cleaner. This was because it was supposed to get rid of a lot of the things that might be clogging up your computer, such as registry errors and temp files. After a while, I guess the software developers decided that the word “crap” was offensive to some people so they just changed it to CCleaner. Even back then, CCleaner was one of those programs that it SOUNDS like you might need for your computer. I mean, why wouldn’t you want to clear out those files and things to keep your computer running nice and fast? But in reality, it’s not something you ever needed. Cleaning out temp files and fixing registry errors (even though that initial scan might show hundreds or thousands of registry issues) just won’t make any noticeable difference in how your computer runs. But it was free, so no harm done at that point, right? Then a few years ago, it started to get obnoxious. I noticed when I saw it on a computer, there would be the CCleaner icon in the lower right corner – meaning that it was running all the time in the background. Apparently it was now “monitoring” the computer for problems. Well, that was not acceptable. The more programs you have running at the same time, the slower they all run. And since CCleaner does not provide any needed service anyway, I certainly didn’t want it to be slowing down the computer. 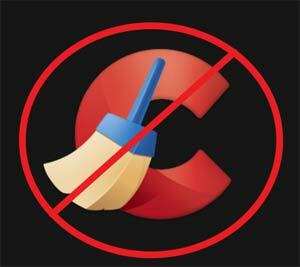 But since then, CCleaner has taken another step in the wrong direction. Brief backstory – you may have read here or heard me on the podcast talking about AVG. A long time ago, it was a decent free antivirus program. For the past few years, however, it has been more of a distributor of malware rather than a preventer of it (I wrote about that here). It’s a bad thing to have on your computer. Well, AVG is owned by Avast (another bad antivirus). And as of about a year ago, CCleaner is also owned by Avast. So they are moving the same direction, and it’s not a good one. By default, when you install CCleaner, it automatically runs in the background every time you boot up. This is the “monitoring feature” and in more recent versions it’s not easy to disable this. You also can’t easily terminate the program when it’s running – there’s no option to “Exit” or “Quit”. Avast purchased CCleaner in July 2017. Within a month, they were distributing a hacked, infected version to anyone who downloaded it. They didn’t even discover or correct this for 4 weeks. And Avast is supposed to be a security company. The Avast web browser is designed to look very much like Chrome, and in some cases users think they are using Chrome but they are actually using this other inferior, bordering-on-malware browser. CCleaner now comes with those wonderful pop-up advertisements that we all know and love. When you consider all of those factors, on top of the fact that CCleaner’s functions aren’t even needed in the first place, it’s a no-brainer – get rid of it. Fortunately, removal is easy – just go to Control Panel or Settings, find it in the list and Uninstall.